Mt Elbrus, Russia (5,633m / 18,510ft). 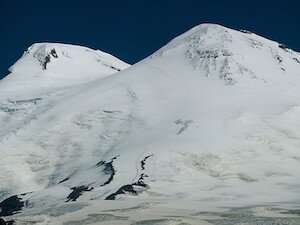 Mt Elbrus’ two summits. The high peak is on the left. Elbrus is a giant dormant volcano, which separates Europe from Asia and consequently has become one of the coveted “Seven Summits” as the highest summit on the European continent. This is a private trip for groups of 2 to 8 people. The expedition travels briefly through Moscow and directly to the mountains where we focus on acclimatisation and getting onto the mountain for our climb. Mt Elbrus has a ski resort on it’s lower slopes and we use the lifts while acclimatising and enjoy some fine spring corn turns. What a way to explore Russia and ski one of the Seven Summits. But being relatively high, Elbrus certainly demands respect for its altitude and we approach this by ski touring high each day and sleeping low (in lovely hotels). 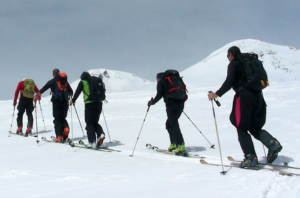 As with any foray to high altitude, it is imperative that expedition members are fit and strong, in good health and strong intermediate skiers or boarders. Any mountaineering techniques need will be taught during the acclimatising period. There is also time for a city tour of Moscow if you wish. Skinning up towards the summit (left). Day 2: Flight to Mineralny Vody, Transfer to Terskol. Stay hotel. Day 3: Ride lifts, then short tour to Cheget Peak (3460m), ski descent. Stay hotel. Day 4: Ski tour up the Adyl-Su Gorge to the Gumachi False pass (3576 m). Stay hotel. Day 5: Azau Ski Station Lifts on Mt Elbrus to Diezelhut (4055). Short tour above. Sleep in mountain huts. Day 6: Ski tour to the Pastuchov’s rocks (4650m). Return to mountain hut. 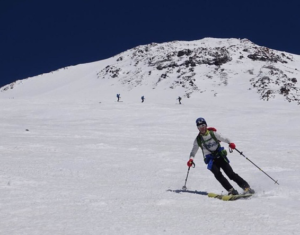 Day 7: Ski tour up to Mt Elbrus summit (5642m). Early start and between 8-12 hours to the summit. Ski down to the mountain huts. Day 8: Bad weather day for summit, or alternative ski tour. Return to mountain hut. Day 9: Descend to Terskol. Stay hotel. Day 10: Transfer to Mineralny Vody, fly to Moscow. Day 11: Depart for home or do city tour. Skiing back down on good corn. Trip Dates: March is the season, dates to suit. Trip Cost: Depends on group size and final custom itinerary. More info: Contact me for further information.